Organic ROOT StimulatorOlive Oil Glossing PolisherFight the frizz, and top it off with a little shine. This light-weight polisher helps add shine, and helps maintain style. It also enhances the hair with incredible shine while protecting it from frizz. 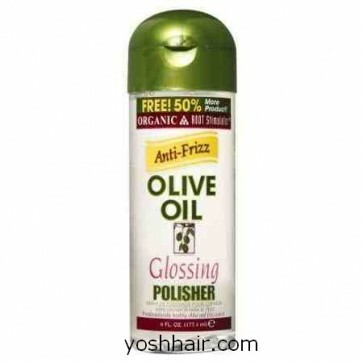 Olive Oil Glossing Polisher:A blend of silicone and natural oils penetrate the hair and provide moisturizing properties that nourish the hair thus protecting it from humidity and providing a lasting healthy shine.Key Ingredients:Olive Oil: Rich in essential fatty acids, it infuses moisture directly into the cuticle. Abyssinian Oil: Natural oil, infuses the hair with shine and provides moisture.Coconut Oil: Natural oil, infuses the hair with shine and provides moisture.Directions for Use:For Frizz Control: Apply a dime-size amount to palm of hands. Rub hands together and distribute evenly through hair. Use either a curling iron or flat iron to seal polisher into hair. Style as usual. For maximum shine, apply again after finishing.For Styling: Style as usual. Apply a dime size amount to palm of hands. Rub hands together and distribute evenly to finished style. Meest verkochte ORGANIC ROOT STIMULATOR producten op een rijtje: ORGANIC olive oil relaxer, ORGANIC olive oil Aloe Shampoo, ORGANIC olive oil Sheen spray, ORGANIC olive oil haarvet, ORGANIC carrot oil, ORGANIC hair mayonnaise, ORGANIC soy oil, ORGANIC jojoba oil, ORGANIC no more flakes, ORGANIC uplifting shampoo, ORGANIC lock & twist gel.Alle prijzen op onze site zijn inclusief 21% Btw. Mocht u willen afrekenen, dan komen er naast de verzendkosten dus geen extra kosten meer bij.GROOT INKOPEN VOOR UW ZAAK?Dit product is ook in te kopen tegen groothandelsprijzen. Vraag naar de voorwaarden. Wilt u kopen tegen groothandelsprijzen stuur dan uw Kvk-nummer, Btw-nummer en adresgevens naar ons toe: yosh@yoshhair.comIndien een product niet op voorraad is, houdt rekening met een levertijd van 6-8 werkdagen. Wij nemen in dit geval binnen 48 uur contact met uw op.